View the layout of the Sabre-Gill (Runabout) built by Peter Booth in his garage. This boat sits well in the water with its 14 degree dead rise. 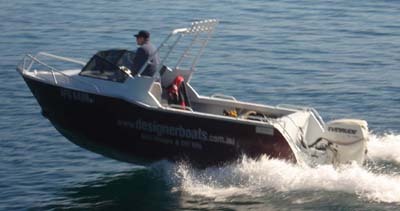 When you slip the boat into neutral, it just glides through the water beautifully and effortlessly. This boat just gets out of the hole and goes with the 115Hp E-tec. With the 115Hp E-tec fuel usage is very small and with the 110 litr fuel tank, it will go a long way. If you would like to see more details on this boat, check out the promo in the design gallery.